Photo Tantra was started by us (Vinayak Das and Snigdha Sheel) in early 2009. We are perhaps the first husband and wife photographer's team in India to start shooting Indian weddings in a more candid style. We both took up wedding photography because we thought it as the best way to experience what we love the most in life and about life and that is exploring new places, meeting new people,making new friends, lots of good food, lots of laughter and conversation. Over the years our team has grown bigger and in 2011 we started an offshoot Alpo Galpo Films which started making wedding films. Currently we are geared up to handle really big weddings which require multiple photographers and cinematographers as well as small intimate affairs which has only a photographers or two. Currently Photo Tantra has a team of handpicked professionals who comprise the core photography and cinematography teams. We follow the same philosophy that Snigdha and I followed from Day 1. Our photography style is a mix of photojournalism and glamour photography. We love to mix candid shots with fun posed shots. We love to shoot everything that happens in an around a wedding; be it the makeup, the family drama, the pranks, the hidden glances or public display of love. We love it all. And how do we do it? By making friends with the couple, their friends and their family, even their pets. It comes as no surprise when a couple wants their furry friends to be shot and put in the wedding album. Cinematographers from our team focus on providing a touching wedding film which captures the true essence of the place, the couple and the event. The approach is a lot similar to our photo team in engaging as friends with the client and shooting the event unobtrusively. Till date we have shot wedding spanning the whole of India. We have also shot destinations weddings in all the major locations in India and International weddings in 7 countries across 3 continents. It was indeed humbling for the Photo Tantra team when we were named as one of the dream wedding photographers in India by Conde Naste Traveler. Our work on candid wedding photography has been featured in many magazines including Marie Claire, Femina, Wedding Vows, Smart Photogrpahy, Indian Express, Bangalore Mirror, Brown Paper Bag, Wedding Sutra, Deccan Chronicle, The Telegraph to name a few. We became the first wedding photographers from India whose images were featured in the People magazine (US edition March 2012). Our photo story of The Big Bang Theory star Kunal Nayyar and former Miss India Neha Kapoor's wedding was featured as a multi page photo spread. Our work was subsequently published in the "Who" magazine in Australia. PhotoTantra takes pride in being the wedding photographers for some of the leading industrialists, eminent lawyers and business houses in India. 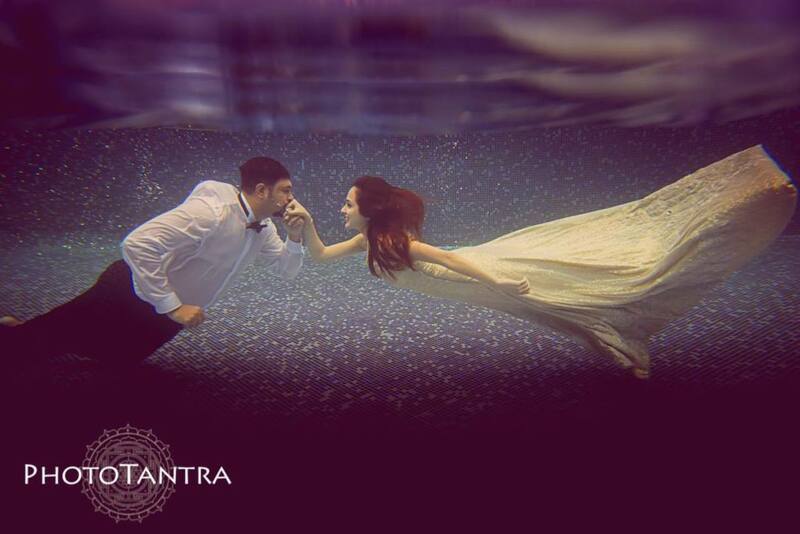 Photo Tantra offers various wedding photography packages and the charges start at Rs. 1,50,000/- per day and Cinematography Packages that start from Rs. 2,00,000/- a day. Since our inception we have done over 350 weddings. It's a great achievement for us considering the fact that we started in late 2009 and have covered weddings from almost every part of India, almost every community in India. We started with a modest Arya Samaj wedding, followed by a big Bengali-American wedding in Calcutta's prestigious Tollygunge Club. There has been no looking back after that. Since then we have shot weddings in palaces in Rajasthan, at quaint small cities, in luxury resorts and at International destinations including a Pakistani wedding in the heart of Scotland. For us every wedding is special and every couple is our favourite couple. Some of them have become our friends and many treat us like their family. It does not matter if it's a celebrity wedding in Delhi Gym Khana club or a simple wedding in a small town in a remote city in South India; we have been blessed with immense love from all the families and the couples who we have shot for. These weddings also came with their set of learning and unlearning. They have all been an opportunity to learn about different cultures, rituals and food. It has made us culturally more aware and enriched. The small details that we now know which no one or no website can tell you. For instance, the importance of Rahu Kalam to a Tamilian when no auspicious work is performed to the more fun filled Kasi yatra where the Groom pretends to change his mind, walk away from worldly affairs to go to Kasi or the interesting contradictions in weddings all across India where a Vidaai or a Mehendi or a Sangeet holds different emotional value to different people or how in some parts of India, wedding feast is a simple vegetarian affair where all guests are served a community meal in relation to the very lavish wedding feasts in a Bengali wedding where food is perhaps as important as the wedding sari. On one hand there are customs which are followed in its very orthodox way and there are customs which are evolving in a very radical way. The Bollywood Sangeet night is one such event has evolved into an integral part of almost every Indian wedding. Similarly, there are customs which have died its natural death or are not followed as much. This institution has also brought so many couples and families of different communities together. It only brings joy to us when we see people of different faith and countries getting married and their families standing by their side all for the sake of their love. These moments are nothing but opportunities thrown at us to learn and accept with an open mind about various communities living in one world. With weddings came a lot of travelling which gave us a chance to explore many cities not only in India but also many cities out of India. With so much travelling and meeting so many people came interesting stories which has enriched our lives as photographers and people. One day when we will grow old these stories will either take the shape of a book or will be stories for our grandchildren; How a bride was on the edge and drove her groom to the Synagogue for their Jewish wedding, how we had to drive equally crazy behind the bride to reach the venue on time without getting lost in the narrow alleys of a short cut that she had taken, decked up in all her bridal fineries and how it ended on a happy note when we reached the synagogue and saw her sitting pretty without a trace of stress on her face, how we get all teary eyed every time we see a family bidding farewell to their daughter. Tales of a wedding between a Srilankan bride and an Indian groom that we shot on a day when the state government had called for a state wide strike, tales of getting stuck in a train on our way back from a small city due to fear of Maoist attack, tales from weddings where women claiming to be hijras (eunuchs) extorting money from the groom and also tales of couples who have selected us not only for our photography but reading about our wedding story on the internet. It's always a great honour when couples come to us and say that we are their dream wedding photographers or videographers. It's so humbling when we are told that they love our work. It feels like a great responsibility to deliver each time when people tell us Phototantra as one of India's top most, popular, famous, finest and sought after team of wedding photographers and cinematographers. In India, they have, a saying that its not the couple but the families who get married. We would like to continue this phrase by saying, - we become narrators of their wedding story for all the times and generations to come. Your message was successfully sent to Photo Tantra. The Photographer may contact you soon.